Scald the tomatoes for a few seconds in boiling water, cool them and skin them. Place the cloves of garlic, scallion and basil in a vacuum bag with the olive oil. Close and cook in a bain-marie for 15-20 minutes. Open, filter and recuperate the oil. Cut the pulp into pieces, separate it and recuperate the water. Heat the flavoured oil in a sauté pan, add the tomato pulp and cook on a high heat for a few minutes. Season with salt and add the tomato water to complete the cooking of the sauce. 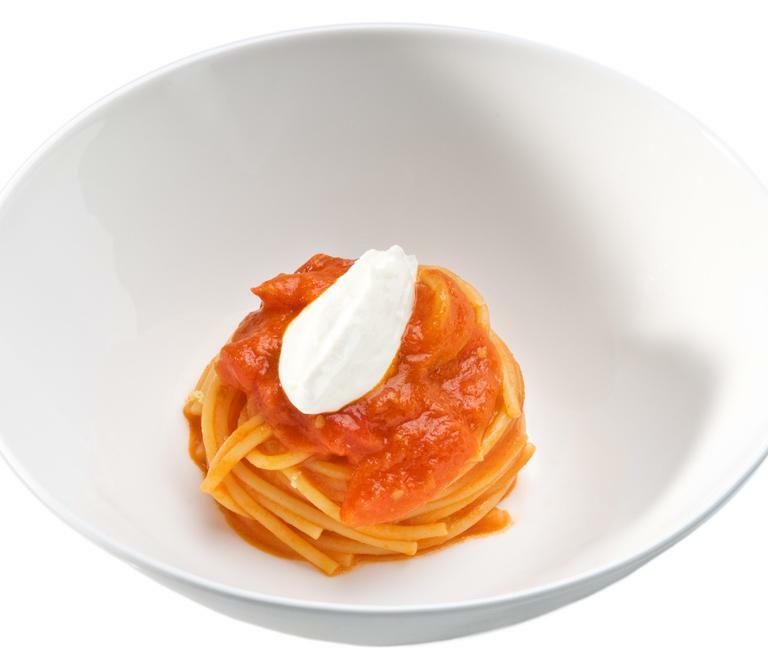 Cook the spaghetti in salted water until still firm and dress with tomato and Grana Padano.